Back at the end of last year I bought myself a relatively cheap GPS unit - the Garmin eTrex personal navigator. I had wanted one for a few years and frankly it felt strange having gone through two related degrees, being interested in the area, and yet still not owning one of my own. For a long time I had felt left out, not being able to take part in things like Geocaching, easily geotagging my photos or helping expand open source mapping databases. For the first few weeks that I had the device, I spent some time working out what situations it would work under - from being in the open, to keeping it in my pocket, to being surrounded by trees, buildings and even inside trains - and what sort of accuracy it could achieve. Whilst doing that I was also building up my database of waypoints around Stuttgart. Christmas time came, and it was time to head home for a short break. It was interesting holding the GPS up to the window on the plane, seeing the acceleration as we accelerated down the runway. This was all experimentation though, in the lead up to my main plan of action for when I got back to the Isle of Man. I wanted to drive as many of the island's roads as possible, taking tracklogs as I went, to allow me to add them to Openstreetmap, the open source database of streets around the world. It has taken me quite some time in the weeks since, but I've finally mapped just about all of the roads I drove (or at least the ones where the GPS was tracking). 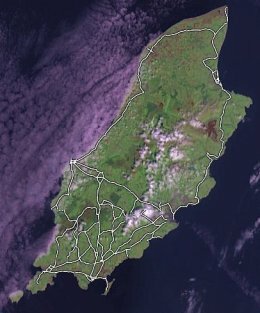 You can see the result by zooming in to the Isle of Man on the site. The mapping of the Island is nowhere near complete (it's mostly the southern end that I concentrated on), and now that I'm back in Stuttgart, I want to see if I can find people located in the Isle of Man with a similar interest in opening up this sort of level of mapping to the public. Anyone with a GPS (and computer connection) can help out by driving some of the remaining roads, or even fixing areas of the map that I've inevitably not mapped as correctly as I would have liked to have done. On the 5th July each year the Isle of Man holds a public holiday for Tynwald Day. This is the one time each year when recent laws of the island must be promulgated - or read to the atendees - in both English and Manx Gaelic in order for them to continue to have effect. You can read more about Tynwald Day in the Wikipedia or see my photos from last years proceedings in the photo gallery section of my site. It was rather disappointing googling for Tynwald Day to find that the Isle of Man Government haven't updated their own page about the day since the Queen attended in 2003. As our only national day, I would have thought that it would be really important to have an up to date information page about it on their website. Update: It is listed in the tourism events calendar, but that's about it, and very little detail is given.